Beginning the week of Feb. 6th, students at A Grade Ahead participated in a craft to celebrate Valentine’s Day. The craft table was set out in the lobby of our Columbus enrichment academies for the students to make Valentine’s Day cards during breaks between classes. To keep the craft simple enough for students to do on their own, the craft table included glitter markers, crayons, coloring pages designed by our own Nicole Acevedo, rhinestones and, of course, foam heart stickers. After the students finished their crafts, they could display it in the academy’s lobby or take it home (some gave them to their friends or teachers!). When the students arrived for class, their eyes immediately went to the craft table. They were given the instructions for the craft and immediately began drawing and coloring with excitement. The craft took some the whole break, and some even went on after class to perfect their Valentine. 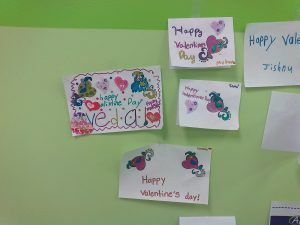 Also, some students valued their Valentine so much they wanted to hang it on the wall themselves. Many students were so enthused they wanted to make more than one Valentine! The Valentine’s Day craft quickly became a competition between friends; a critical thinking exercise; a display of artistic skills; a showcase of love for parents, friends, and the teaching staff; and a fun activity to pass time. That’s a lot for a simple craft! What kind of Valentine’s Day Cards will your children make? We hope they have as much fun as our students did!